Because you don’t want to stand over the stove and stir the risotto! Here’s a simple baked option that cooks itself, thanks to Lauren with Healthy Delicious. Preheat the oven to 425*F. Remove the casing from two sausage links and crumble the meat into an oven save skillet or enameled dutch oven set over medium heat. Cook, stirring occasionally, until the sausage is browned. Add the onion and garlic and cook another 2 minutes. Stir in the rice and cook for 1 minute, or until the grains mostly translucent with a small white center. Stir in the wine and cook until it is all evaporated. Add the chicken stock and bring to a boil. Cover and transfer to the oven. Bake for 20 minutes, or until most of the liquid has been absorbed. 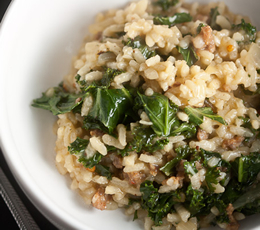 Stir in the cheese and kale, allowing the heat of the rice to wilt the kale. Bake an additional 10 minutes. Meanwhile, cook the remaining sausage links. Sear them over high heat until the skins are deeply browned and begin to blister. Transfer to the oven until cooked through.